Cobleskill-Richmondville, in conjunction with neighboring school districts and Green Mountain Donkeyball, are set to host the uniquely commissioned "Donkey Basketball Fundraiser" on Friday, May 2, 2014 at 7:00 pm to benefit the AED Project of Schoharie County. 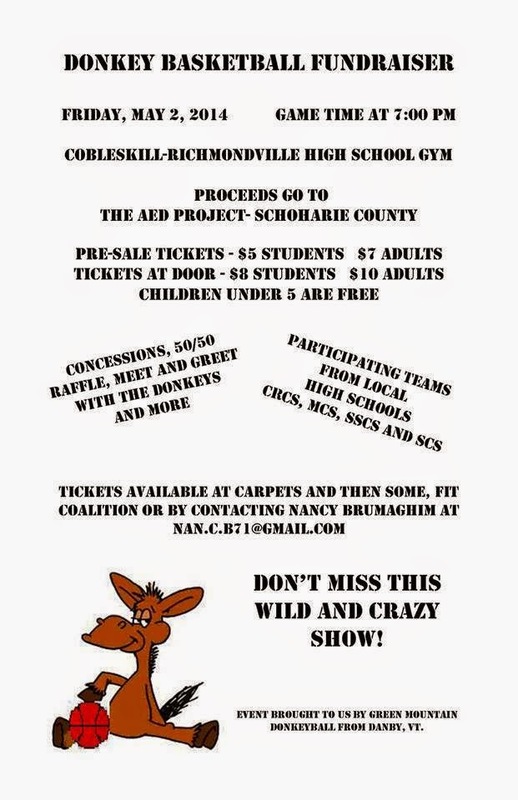 The donkeyball match, which will be held inside Cobleskill-Richmondville High School gym, will have participating teams from several local high schools, and in addition to the wild and crazy show on court, the event will also feature concessions, 50/50 raffle, and an opportunity to meet with the donkeys. Pre-sale tickets cost $5 per student/$7 for adult and can be obtained by visiting Carpets and Then Some, Fit Coalition or by contacting Nancy Brumaghim at nan.c.b71@gmail.com. Tickets will also be available at door, but with a slightly higher price tag of $8 per student/$10 for adult.